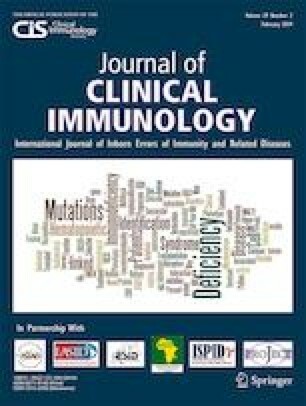 Inborn errors in interleukin 2 receptor, gamma (IL2RG) perturb signaling of the common gamma chain family cytokines and cause severe combined immunodeficiency (SCID). Here, we report two brothers suffering from chronic cryptosporidiosis, severe diarrhea, and cholangitis. Pan T, B, and NK cell numbers were normal, but immunophenotyping revealed defective B cell differentiation. Using whole exome sequencing, we identified a base pair deletion in the first exon of IL2RG predicted to cause a frameshift and premature stop. However, flow cytometry revealed normal surface expression of the IL-2Rγ chain. While IL-2, IL-7, and IL-15 signaling showed only mild defects of STAT5 phosphorylation in response to the respective cytokines, IL-4- and IL-21-induced phosphorylation of STAT3 and STAT6 was markedly reduced. Examination of RNA isoforms detected alternative splicing downstream of IL2RG exon 1 in both patients resulting in resolution of the predicted frameshift and 16 mutated amino acids. In silico modeling suggested that the IL-2Rγ mutation reduces the stabilization of IL-4 and IL-21 cytokine binding by affecting the N-terminal domain of the IL-2Rγ. Thus, our study shows that IL2RG deficiency can be associated with differential signaling defects. Confounding effects of alternative splicing may partially rescue genetic defects and should be considered in patients with inborn errors of immunity. Christoph Klein and Daniel Kotlarz contributed equally to this work. The online version of this article ( https://doi.org/10.1007/s10875-019-00606-7) contains supplementary material, which is available to authorized users. Our work is dedicated to the patients who sadly succumbed during the course of our studies. We thank the medical staff at the Departments of Pulmonology, Allergology, Rheumatology and Clinical Immunology and the Referral Center for Pediatric Gastroenterology and Nutrition at the Children’s Hospital Zagreb. We acknowledge the assistance of the Next-Generation Sequencing Facility and the Flow Cytometry Core Facility at the Dr. von Hauner Children’s Hospital. D.I. designed and conducted experiments and analyzed the data. R.C. supported immunophenotypical analysis. M.N., J.K., I.H., and O.J., recruited and clinically characterized the patients and were critical in the interpretation of the human data. M.Ć. performed histological analysis and J.V. performed pre-transplant hepatological evaluation. M.R. conducted whole-exome sequencing and S.H. performed the bioinformatics analysis of sequencing data. J.B. interpreted splicing mechanisms. C.K. and D.K. conceived the study design, supervised D.I., and recruited study participants. D.I., C.K., and D.K. wrote the draft of the manuscript. All authors interpreted the data and approved the final version of manuscript. This work has been supported by The Leona M. and Harry B. Helmsley Charitable Trust, the Collaborative Research Consortium SFB1054 project A05 (DFG), PID-NET (BMBF), BioSysNet, the European Research Council, the Gottfried–Wilhelm–Leibniz Program (DFG), the DAAD network on ‘Rare Diseases and Personalized Therapies’, the German Center for Infection Research (DZIF), and the Care-for-Rare Foundation. D.I. was funded by the Hanns-Seidel-Stiftung and received ideational support by the Studienstiftung des deutschen Volkes. D.K. has been a scholar funded by the Else Kröner-Fresenius-Stiftung, the Daimler und Benz Stiftung, and the Reinhard Frank-Stiftung.